Ornament in its primitive manifestations is geometrical rather than naturalistic. This is in a manner strange, that the abstract and metaphysical thing should precede the concrete and sensuous. -from The World Order One of the most respected philosophers of architecture in the early 20th century, Bragdon here makes a plea to his fellow architects and the public at large to choose organic designs for public structures, and to reject the abstract modern architecture coming into vogue in the post World War I period. Examining building design on either side of the great, modernizing divide of the war, he argues for a softer, more human aesthetic, and offers numerous imaginary compositions, the products of his own fanciful yet logical creativity, to illustrate his points. First published in 1918, this highly readable volume has much to contribute to today's discourse on how to organize the public realm. 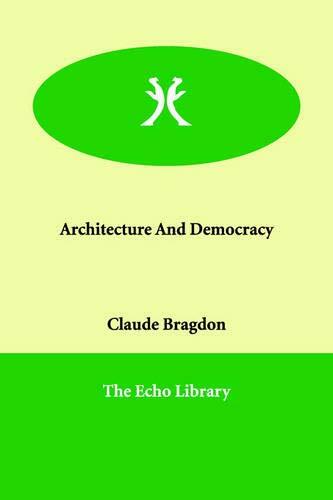 Other works by Bragdon available from Cosimo Classics: More Lives Than One, The Beautiful Necessity, Episodes from An Unwritten History, and A Primer of Higher Space (The Fourth Dimension). American architect, stage designer, and writer CLAUDE FAYETTE BRAGDON (1866-1946) helped found the Rochester Architectural Club, in the city where he made his greatest mark as a building designer with structures including Rochester Central Station, Rochester Institute of Technology, and the First Universalist Church; he also designed Peterborough Bridge in Ontario. In later life, Bragdon worked on Broadway as scenic designer for 1930s productions of Cyrano de Bergerac and Hamlet, among others.